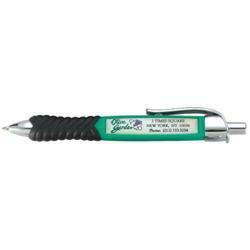 Sturdy retractable pen with Dome printed barrel with full color imprint. This ballpoint pen showcases those multi color logos very well. Writes smoothly as well in black ink. Individually cello packed, add $.05 per pen. Great for multicolored logos! No pms color match on 1-4 imprint colors for dome imprinting.